Unless you live in the Southern Hemisphere, winter is upon us and up in Canada, that means it’s time to add some layers. Often, we think about adding layers over our outfits, but there are also ways to layer under our clothes that add warmth without adding bulk. Below, I’ve put into writing some winter styling tips which are also great for travel because they allow you to pack light and versatile clothing that will keep you toasty warm. You don’t have to pack away your pretty summer dresses if you layer them over warm thin knit shirts. My favourites are merino wool blend turtlenecks, which I own in a variety of colours. Paired with some thick wool stockings, I’m pretty warm and don’t feel like I’ve added too much bulk to a dress. Looking for more winter packing guides? Check out these past winter blog posts. If a silky shirt feels too cold against your skin, try building your outfit on the warm foundation of a performance tank top or bra. The temperature-regulating base layers are small but mighty and make for a good undershirt for sweaters too. Wear your denim and leather jackets like a blazer and layer them between sweaters and overcoats. The contrast in textures is interesting and it gives you more options when you’re moving between temperatures throughout the day. Silk is great and I’m not just talking about blouses but performance base layers too! You can get great thin long sleeve shirts to wear under sweaters and tops, which adds a temperature-regulating layer to keep you comfortable. 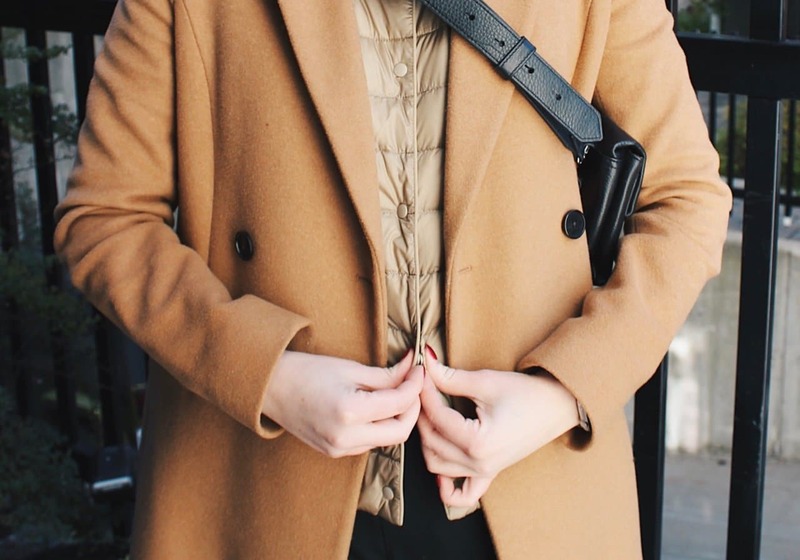 To extend the wearability of my wool coats, I like to layer them over a thin down puffy vest. Backpackers will tell you vests are awesome because they give you the most warmth and freedom of movement. In fact, when your core temperature starts to drop, the body reduces blood flow to your extremities and increases blood flow to the core to protect your organs. By keeping your core insulated and warm, your blood flows consistently to your extremities, keeping them warmer too (which is good because gloves are a bit of a hassle). Even if your pants are wool, it’s nice to have an extra little layer of comfort on your skin, which you can get with silk, wool, or synthetic longjohns. Also, don’t skimp on good socks. Choose comfortable wool socks, they’re worth the investment. The fun thing about layering is you can add interesting elements with different textures and shapes. If you have a long vest, a blanket coat, a cape, or something else, why not try layering it over a puffy coat, blazer, or chunky knit. Play with proportions a bit. Winter is too long to stick to one look. Do you experience a rainy winter season? Feel like none of this applies to the slushy weather in your city? Read my tips for rain and stormy-weather packing.